Somehow we’ve lost track of time here at the farm, and it’s already February. We can hardly believe it’s been since early December that we took the time to stop, sit down, and actually write a blog. Yikes! The critters are definitely scolding me for not sharing all of their delightful antics with their adoring fans. So what has been going on with farm life since the holidays? Here are a few of our latest adventures. River knocks the gate off the hinges. Nightmare investigates. 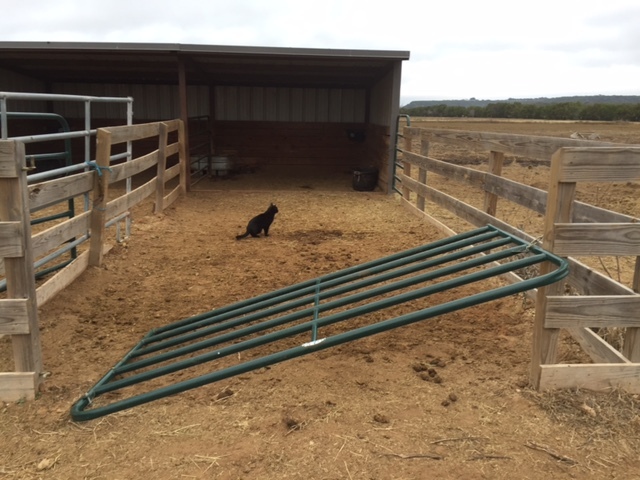 The great escape – River the mustang got crafty and busted out of his stall one night. While he used force to knock his gate off the hinges, he used is agile lips to unlock the stalls of his two brothers. Who needs opposable thumbs? We awoke to a gelding party at the hay, while poor Suzy Q watched on. Clearly this was a boys adventure. And just in case fun was not enough, in his great escape River managed to finagle a minor injury to his eye, and so we helped the vet to have a merry Christmas. He’s healed. Gates are fixed. And new gate locks installed, thumbs required. The tough but lovable little Chip. Happily using his box again and dining like a king. 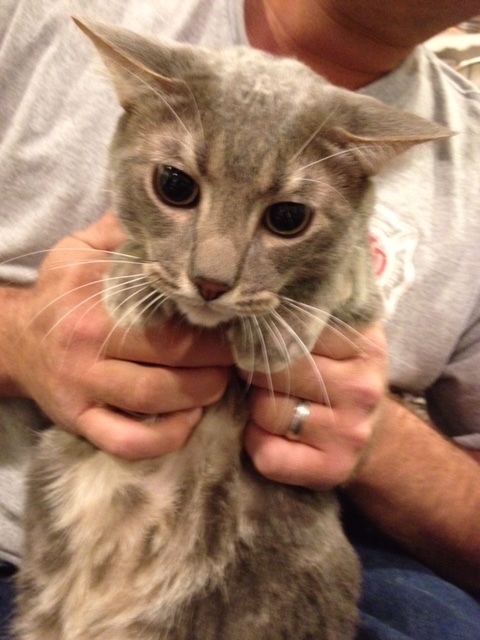 Litter box bingo – Chip the kitty ended up with a bladder blockage. How did we know? Poor cat was howling and licking like he had lost his mind or was desperate to find a girlfriend. Freaked this farm mama out! And yes, in case you were wondering, these things happen in the middle of the night. How else is a cat to gain his person’s attention? The result was 48 hours in the kitty hospital and a new food. Since feeding seven cats separately is not an option (remember the EDS commercial where cowboys herded cats), the $60-per-bag cat food has turned dinner time from kibble to ooo-la-la delicious for all the farm felines. Cowboy and I visit the big city at Christmas. 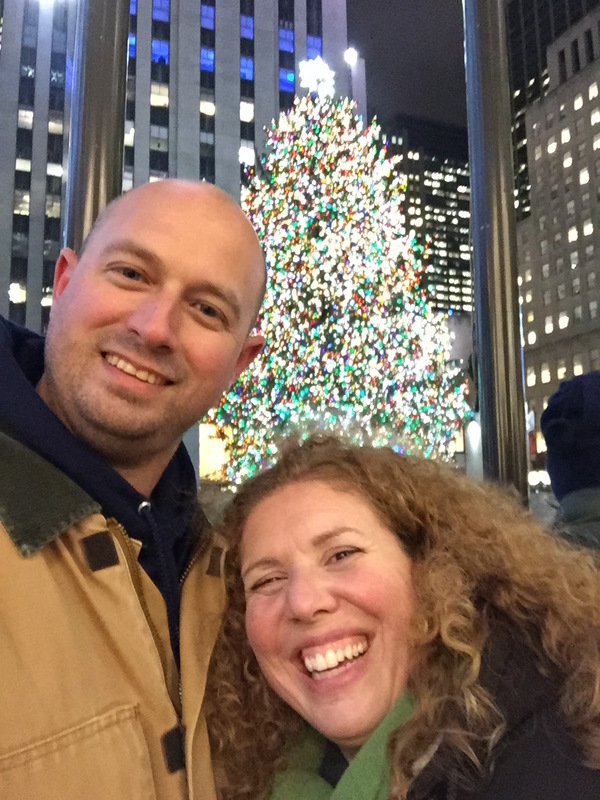 Country mice visit the city – December also offered Cowboy and me the opportunity to get away for a couple of days, so we headed to New York City (just imagine the voice of the Pace Picante guy saying that.) It’s been on my bucket list for years to see the city all lit up for Christmas. And let me tell you, it was definitely spectacular. Cowboy must have looked like a trustworthy southerner, as he was often asked to take folks’ pictures and even for directions on the subway. I guess they don’t think a cowboy will run off with their phone and will actually take the time to stop to help them figure out how to navigate the maze. He did not disappoint! We had a fabulous time, but these two country mice were more than happy to wave farewell to the big city and settle back into Texas. Cowboy’s face lit up as we landed back in the lone star state and drove back home to the farm, population 2 humans and 16 critters. So we welcome in the New Year (although a little late), and hope you’ll stick with us through 2015 as we continue to share stories that inspire us and make us laugh, and occasionally offer a tip or two for country living. Wishing you a blessed 2015 from our farm to yours.